Billet brothers Emmett Sproule and Chad Yetman (15) hooked up on an overtime two-on-one as the Erie Otters edged the visiting Guelph Storm 3-2. The Otters let a 2-0 lead get away in the third period before recovering on Yetman’s first goal since Dec. 28th. Daniel Murphy picked up the win with a 30-save performance for Erie opposite Guelph’s Anthony Popovich who helped the Storm earn a point with 30 saves of his own. Gera Poddubnyi (21) and Brendan Hoffmann (6) also scored for Erie while Isaac Ratcliffe (34) and Fedor Gordeev (5) responded for Guelph. Ratcliffe now has points in 12 straight games and goals in 10 of his last 12. The Otters win their seventh overtime game of the season, returning to the win column following five straight road losses as they improve to 19-26-1-1, three points back of eighth place Windsor in the Western Conference. The Storm fall beyond regulation for a ninth time this season, dropping to 25-13-5-4. Kade Landry (4, 5) scored twice, firing home the overtime winner as the Hamilton Bulldogs scored a 4-3 win over the visiting Mississauga Steelheads. 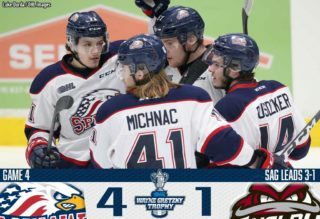 Hamilton ended Mississauga’s four-game winning streak as Landry had help from Matthew Strome and Arthur Kaliyev who drew assists on the overtime winner. Overage forward Owen Burnell (1) scored in just his second game of the season while Isaac Nurse (9) also found the back of the net. The Steelheads swam upstream from a 3-1 deficit, tying things up on third period goals from William Portokalis (3) and Alan Lyszczarczyk (25). Thomas Harley (10) also lit the lamp as Mississauga earned a point in the OT loss. Rookie netminder Joe Ranger stopped 36 of 40 for the Steelheads opposite Hamilton’s Zach Roy who turned aside 30 shots. The Bulldogs earn their third straight win, pulling into a fifth place tie with Mississauga featuring a 23-21-3-1 record. The Steelheads are now 22-19-5-1. The Soo Greyhounds earned a seventh straight win, racking up eight goals against the visiting Peterborough Petes as Morgan Frost (31) scored the 100th marker of his OHL career. The Hounds trounced the Petes 8-2, spreading the scoring around after a scoreless first period. Jaden Peca (9), Mac Hollowell (15), Ryan Roth (18), Joe Carroll (8), Brett Jacklin (3), Cullen McLean (5) and Rory Kerins (5) all found the back of the net for the Greyhounds as they outshot the Petes 36-25. Chris Paquette (19) and Max Grondin (11) scored Peterborough goals while Adam Timleck drew assists on both. The Hounds improve to 31-10-4-1, leading Saginaw by three points atop the West Division. Peterborough drops a third straight contest, falling to 23-22-1-1. The Niagara IceDogs earned their fifth straight victory, defeating the Sarnia Sting 4-3 on the road. Jack Studnicka (19) earned first star honours with a goal and an assist on Philip Tomasino’s (23) third period game winner. Ben Jones (28) and Kyen Sopa (15) also scored for the Dogs while Stephen Dhillon made 29 saves. Sarnia pressed late, but couldn’t foil Dhillon as Jacob Perreault (22), Ryan McGregor (16) and Jamieson Rees (9) accounted for goals in the loss. Sarnia outshot Niagara 32-27 but suffers a third straight loss and ninth in the past 10 games, falling to 19-22-5-2. Niagara keeps rolling, increasing its Central Division lead to eight points with a 29-10-7-0 record. The Owen Sound Attack snapped a six-game slide, defeating the visiting Flint Firebirds 5-2. 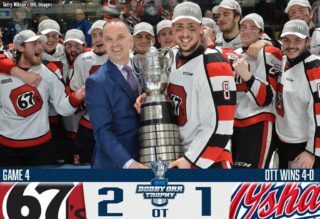 Cade Robinson (5) broke a 2-2 tie with 3:36 remaining in the third period to put Owen Sound ahead for good as Mack Guzda made 24 saves in the crease. Zach Poirier (8), Aidan Dudas (18), Maksim Sushko (10) and Daylon Groulx (12) also scored for the Bears as they outshot the Firebirds 29-26. Emmet Pierce (3) and Cody Morgan (4) scored Flint goals as the Firebirds fell to 9-37-3-0. Owen Sound sits fifth in the Western Conference with an overall record of 23-20-2-2. Kai Edmonds stopped all 35 shots he faced for his first shutout of the season as the Barrie Colts blanked visiting Kingston 4-0. Luke Bignell (8), Dalton Duhart (10), Jacob Tortora (12) and Aidan Brown (8) scored Barrie goals while Kingston goaltender Marshall Frappier made 30 saves in the loss. The Colts earn their 20th win, improving to 20-24-2-0 as they sit five points back of eighth place North Bay in the Eastern Conference. Kingston drops a fourth straight decision and a ninth in the past 10 games, falling to 12-34-1-0. 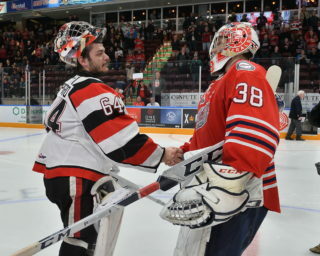 Cedrick Andree stopped all 38 shots he faced for his third shutout of the season as the Ottawa 67’s shut down the visiting Oshawa Generals on the Sportsnet CHL Saturday Showcase. 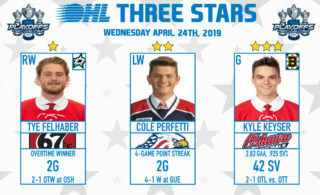 Ottawa’s fourth straight win saw OHL scoring leader Tye Felhaber (50) become the franchise’s first 50-goal scorer since 2011-12 while Merrick Rippon (4), Marco Rossi (20) and Graeme Clarke (16) also got onto the scoresheet. Mitchell Hoelscher picked up a pair of assists and Andree was the difference as Ottawa won despite being outshot 38-28. Kyle Keyser made 24 saves in the loss for the Generals as they suffer their second straight loss against Ottawa. The 67’s improve to an OHL-leading 34- 9-3-1 record. Oshawa falls to 28-17-2-0.